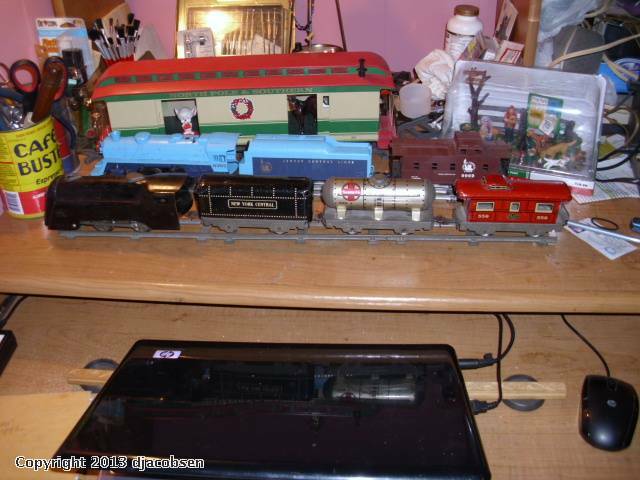 I got my start in O27 with a Sears/Marx-Allstate O27 Freight Set for Christmas in 1959. It's only taken 52+ years to return to my roots in electric trains, with the acquisition of a '72 MPC/Lionel Blue Streak Freight Set. For now, I'll stay a roundy rounder. I just have the basic circle of track that came with the set. So until a couple switches and more track comes my way, I'll be content, listening to the clickety clack of the wheels as the train goes roundy round. 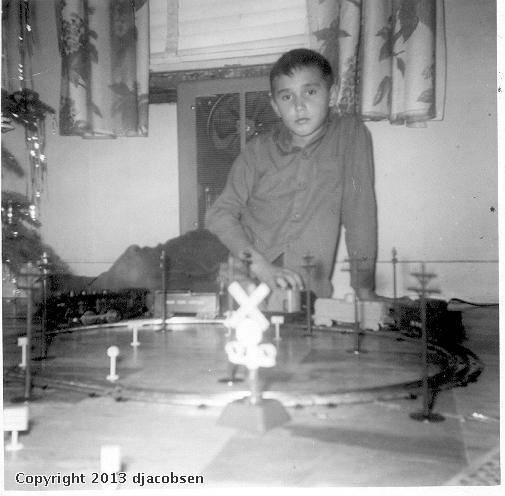 And once more become that 9 year old boy, playing with his train. That's what a lot of the hobby is about! I've decided to go with nostalgic painted board layout. I'll be adding structures & accessories, but they will have to be scratch built. I've been searching for used O27 track, and came across a offer of some Marx train sets, Lionel O27 track, switches, crossovers & a big box full of accessories.. The price was right, so I went for it. The true decision to get them was one of the sets is the same set that I received as my first electric train. Waiting for the rolling stock, track & accessories I found myself under the thrall of mechanical trains. My very first train was a Marx wind up, nothing fancy, probably the bottom of the line set for it's day. Didn't matter to me. I wasn't aware of the various grades of sets, what was important was that I had a train. Was it the looks of Tin Plate Trains, or just nostalgia? I don't know, but I've purchased some. A Marx Vanderbilt, originally purchased to send to my Great Grand Nephew. Now that I have it in my possession, I believe that it's not a good choice for a 5 year old. I've purchased a newer plastic locomotive and plastic cars to give to him, and will keep the Vanderbilt for myself. Now I really need to reconsider what type of layout to build, since it will be running both electric & mechanical trains. More track on the way...It will be nice to be able to do more than just go roundy round on a small oval of track. 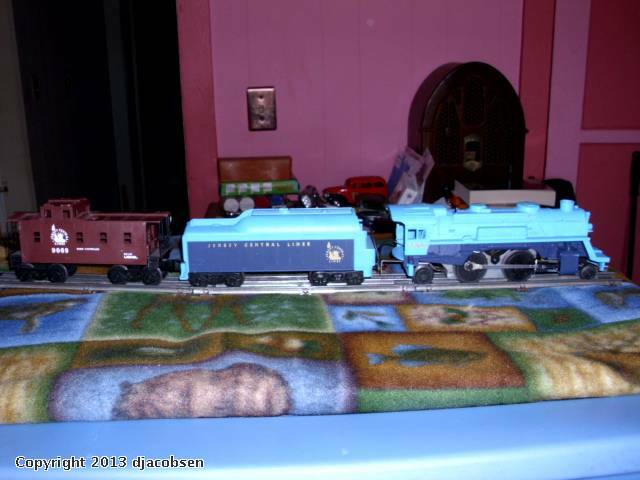 I've purchased a couple of cars, a PW Lionel 6035 Sunoco Tank car & a Lionel PW 6656 Livestock car. So, slowly the accouterments of a layout are coming together. I have to thank Frank 53 for the 6656 & O31 track. Thanks Frank! Also have to thank Steve 'Papa' E. for a bunch of straight's & a circle of O54's. be ready to start on a layout. I finally acquired through some trading, my "Dream" locomotive. 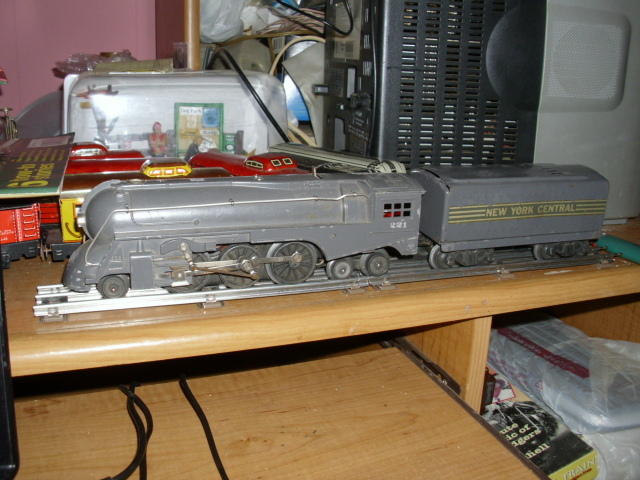 A Lionel PW 221 Dreyfuss Hudson with the 221W Tender. I got the Marx trains, Track & accessories here to Texas from St. Louis and traded for a couple boxes of Lionel & Marx Locomotives & Rolling stock. I've got enough track, switches & crossovers to do a serious layout once we get moved to Missouri.